Gnewsense and Blag | Trisquel GNU/Linux - Run free! Aside from my beloved Trisquel. I'd like to contribute to the Blag and Gnewsense projects. The problem is that there's not an active community (as far as I know)... Yeah, I know, I can contact them by the IRC channel, but it is not as engaging. I'm not a programmer, but I've helped with translations with the TOR project and the Mate Project. Have you heard of Gnewsense 4? It'll be based on Debian 7... or do you think it is still too outdated. 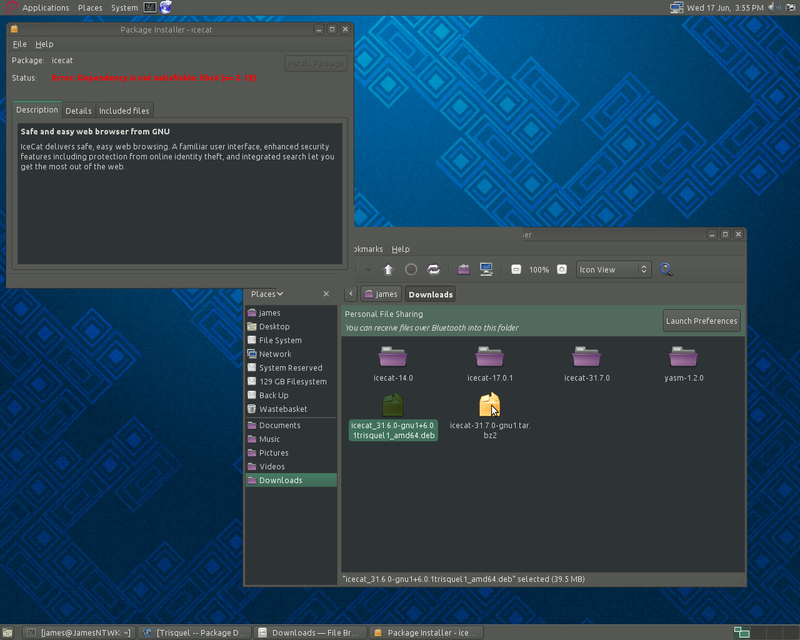 BLAG 140k is based on Fedora 14, which reached end-of-life four years ago. BLAG has been in this state of development hell for years. Frankly, I think the FSF should put its foot down, take BLAG off the distro list, and tell the BLAG developers that until they can PROVE that BLAG is still actively developed by making a new release already, the link will not be restored. And a policy should be put in place so that this doesn't happen again with another distro; some requirement of recent non-preview software updates. dyne:bolic is another distro that I'm not convinced is actually being maintained; its last release was four years ago, easily old enough to render all of the tools on it obsolete. gNewSense, on the other hand, had a recent release, though it's true that it's based on the old Debian 6. Debian 6 still has support in the way of security fixes for a couple of years, so it's nothing like the situation of BLAG. Wow onpon, that is harsh. They are even working on a unified Libre Forum for Blag, Parabola, gNewSense and others. Trisquels forum is quite active so they did not see a reason to have this Forum join the new one. So I would say that is still actively developed! You know, I like the idea of the Libre Forum. Firstly, the blag-users mailing list is so inactive it's like a ghost town, and the blag-devel mailing list isn't all that active either, with only 8 messages this month. Secondly, all of the emails I see in blag-devel are people sending feedback! You know, reporting problems and making suggestions. This is not an indication of development! Thirdly, and this is the most important bit, when someone looking to try out BLAG goes to the BLAG website, they do not see the 200k alpha release, which as I pointed out is based on an upstream that's about to reach end-of-life anyway. They see the 140k release which is based on an upstream that reached end-of-life 4 years ago. I was well aware of the 200k alpha release; I learned about it when it was announced last year. But an alpha release, by definition, is unfinished, and the BLAG developers are clearly not proud enough of it to put it on the downloads page. I don't think any of what I said is "harsh", and I stand by it. BLAG is in endless development hell, has been in this state for years, and under absolutely no circumstances should be recommended to anybody for real use in its current state. Also, you may find it interesting that Fedora is planning on having LTS versions as well, which means Blag, would also be LTS. One of the things they are dealing with is removing some of the questionable software/programs that RedHat/Fedora includes..ie: SELinux and others. Considering it is a new team and the nature of the beast (Fedora short release cycle), I do not think you can compare it to Trisquel yet... Just like you cannot compare Parabola to Trisquel, completely different. If Fedora and they go LTS then perhaps it can compare. Libre distros. in particular need to support one another, not find reasons to trash each other. Blag will find a niche just like Trisquel has, will be most interesting if they go LTS. I don't know if you're a BLAG developer speaking from experience, or just some random guy making assumptions about the project. But it makes no difference. Far as I can tell, BLAG is developed behind closed doors; at the very least, I can't find any sort of link to a repository on the BLAG website or forum. Not a problem, but the BLAG project is going to have to accept, then, that when the last thing they put out was an alpha release a year ago based on a version of Fedora that's losing support, and their download page still points to a very old release based on a version of Fedora that lost support four years ago, it looks like the project is inactive, or at least not being taken seriously. > Also, you may find it interesting that Fedora is planning on having LTS versions as well, which means Blag, would also be LTS. Great, so we might eventually have a version of BLAG based on a version Fedora that at least gets security patches for a while. But considering this is speculation about the future, I don't think it's relevant to the question of whether the FSF should be linking to BLAG now. Correct. Trisquel, unlike BLAG, currently has a proper release which gets security fixes for a few more years, and has a track record of providing new releases in a timely manner. BLAG only has security fixes for the next week, in an alpha release. > Libre distros. in particular need to support one another, not find reasons to trash each other. Don't try to shoot me down with that emotional crap. I never "trashed" BLAG. I just said that it's in development hell, not fit for any real use, and shouldn't be recommended by the FSF or anyone else in its current state. > Blag will find a niche just like Trisquel has, will be most interesting if they go LTS. More speculation about the future. Such speculation is completely meaningless. Currently, BLAG is in a state of development hell. Maybe it will end, maybe it won't. But in the meantime, neither the FSF nor anybody else should recommend BLAG to anyone. We're at Fedora 22 already, and have been for more than 2 months now. 2016, that's in 7 months from now. BLAG on CentOS instead, which has a life cycle of 10 years. I liked the idea that Blag was based on Fedora. I think the FSF keeps Blag on the distro list is because there are people with very old hardware would be using those old distros. Nonetheless, you've got a point. There should be AT LEAST a separation where they put: "These are the distros maintained more closely", and one that helps programmers focus "These are the distros that should be maintained"
Check this out regarding the new version of Gnewsense: https://en.wikipedia.org/wiki/GNewSense Go to the part in which there is listed the Gnewsense versions. Since Gnewsense 4 will be based on Debian 7, we'll have availability for better packages like those of Libre Office or Icecat. Since I'm using Gnewsense 3.1 I had to compile Icecat 14 on my own. For some reason, I couldn't compile Icecat 17, so by getting it from Debian 7, Gnewsense will not have too many issues like this. IceCat 17? The current version is 31.6. Yeah, but couldn't find a tutorial on how to compile that one... I had issues with Icecat 17, so I kept the IceCat 14... Does it work the same? Compile?? Icecat? What for? You need the latest tar, extract it, open the folder and run the executable. And I attached an image so you can see that I couldn't install it. By the way, I'm in Gnewsense, just to point it out. By the way, having old hardware generally isn't a good reason to use a system that doesn't get updates, and that's not why BLAG is still on the list. In fact, the FSF briefly removed BLAG from the list, but then added it back on shortly after the 200k alpha was released, because they decided this was an indication of activity, IIRC. It was not long after I wrote this that I installed Trisquel 6.0, which has worked well for me ever since. Will do a fresh install of 7.0 soon, on a larger partition. Apparently the FSF do support gNewSense, which I haven't tried since 2.3 "deltah", and Utoto, which I haven't tried at all. Oh man that was funny. Brick has to be the most secure OS of all time. BLAG 200k is still available for download here: ftp://blag.fsf.org/ All I did to find out about it was take this download link: ftp://blag.fsf.org/140000/en/iso/Blag-140k-i686.iso And shorten it. It's just that it's still not a very recent version, however it's more recent than BLAG 140k. That's an alpha release, based on a Fedora release that goes unsupported next week. There haven't been any further updates to BLAG since then. I'm not impressed. See, this is just a continuation of the development hell BLAG is in. At this point, BLAG 200k clearly has to be scrapped, so at best someone will build a BLAG 220k alpha when Fedora 23 comes out. And then it won't get any more updates, Fedora 22 will reach end-of-life, and the process repeats. This is not a healthy distro maintenance effort. What needs to be done is someone has to make a dedication to take the current version of Fedora, or better yet, the next version of Fedora, and get a release out based on it in the span of at most a few months (or if the next Fedora release is the base, a couple months after that Fedora version's release). Then they have to continue doing this for all future Fedora releases. It seems that there just isn't anyone on the BLAG team who is willing and able to do this. Again read the above post. Perhaps do a little research before posting. Blag is active and I tried their 20K alpha release a few months back. It was good. Blag is active and I tried their 20K alpha release a few months back. Blag 20k is based on Fedora 20... whose support is over. packages (statically linked); lightweight alternative software..